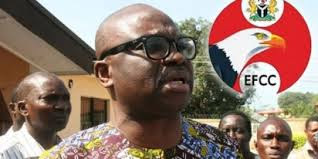 The outgoing governor of Ekiti State, Ayodele Fayose, has sue the Economic and Financial Crimes Commission (EFCC) to court for naming him on a watch list and instructing that he should be pin down if he attempted to travel out of the country. He is demanding a total of N20 billion as damages. His grouse is that the order was a violation of his rights since he is still a governor with immunity. According to Mr Fayose, the EFCC’s action not only breached his constitutional immunity, it also exposed him to public opium and ridicule. He said the instruction that he should be arrested was “anathema” to the laws of the land. In a letter by his counsel, Obafemi Adewale, dated September 3, 2018, the governor had given EFCC 72 hours to withdraw the request/directive to security agencies to place him on security watch list and publish a written apology to all security agencies in Nigeria, three national newspapers and the social media. The special assistant to the governor on public communications and new media, Lere Olayinka, said in a statement issued on Tuesday, that consequent upon EFCC’s failure to accede to his demands as contained in the letter, the governor’s counsel filed the suit number FHC/ABJ/CS/1087/2018 in Abuja on Friday. The agency later deleted and disowned the tweet. The EFCC is also seeking to investigate Mr Fayose’s link to the funding of the 2014 governorship election, which allegedly benefited from funds from the office of the national security adviser under Goodluck Jonathan. The commission also urged other security agencies to arrest the governor if he tried to leave the country. On September 12, Mr Fayose elected to submit himself to the commission as soon his tenure ends. The governor is also seeking a declaration that the statements contained in the EFCC letter dated September 12, 2018, and addressed to all security agencies in Nigeria portraying him as a criminal, a fugitive and a run-away from the law are not true, are malicious and are not fair statements.